According to a recent report from Tech Times, a study has found that, while a total knee replacement procedure seems to the best form of pain relief for patients suffering from severe arthritis, there may be more risks associated with the procedure than even a well-informed patient might realize. Study writers contend while total knee replacement is generally a safe and effect treatment for severe osteoarthritis, some of the safety data being used by the medical community in determining the level of risk was not based upon the most sound research practices. They are concerned with the fact that, even though total knee replacement operations are being performed hundreds of thousands of times in the United States alone, there does not appear to be even one randomized and controlled study designed to compare the use of surgical and nonsurgical options when treating a patient with severe osteoarthritis. Essentially, under the current nationally recognized standard of care, a doctor will first try non-surgical procedures, such as recommending increased exercise, including walking, proscribing orthotics for a patient’s shoes, and using oral or injectable medications. If these options do not work, then the doctor will generally recommend a total knee replacement in either one or both knees. In some cases, they are done one knee at a time with months or years in between, or now they are doing a somewhat controversial but popular bilateral knee replacement in which a patient gets two knees in one operation. As part of this recent study, the authors employed the assistance of nine surgeons in Holland who had 100 patients who were approved for a single knee replacement procedure. The study was designed to determine if there is a way to reduce the risk of post-surgical complications or even failure. In the study, some patients would have a total knee replacement procedure and then follow standard follow up care procedures at an approved rehabilitation center, which included 12 months of nonsurgical treatments. The second group of patients would not have any knee surgery, but would instead try the nonsurgical treatment options. As one might expect, the group that had surgery did fare better in terms of pain reduction than those patients who had nonsurgical procedures alone. Again, while they concluded the surgery was better for patients in reducing knee pain, it did come with some complications. 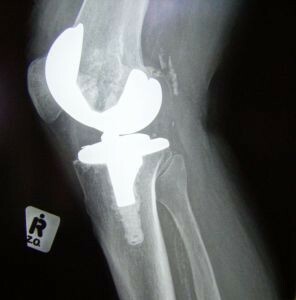 While this study yielded interesting results, and anything that can be done to ease the pain of those suffering from severe osteoarthritis is a positive thing, there a very high chance there will be serious complications following surgery, including severe pain and suffering cause by a total failure of the device, if the artificial knee joint implanted was defectively designed. Your artificial knee injury attorney in Boston has handled cases involving a variety of different artificial knees that were manufactured in multiple countries. The Stryker knees, for example, have been a major cause of pain and suffering when their devices failed. We have also seen cases where the company shipped defective cutting guides for surgeons to use when performing a knee replacement surgery. Even the most skilled surgeon relies on a guide as to where to make specific cuts, and, if the numbers are even slightly off, the device can fail. When the doctor is given a defective cutting guide and doesn’t know it, there is not much he or she can to prevent such an injury.